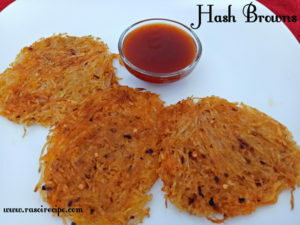 Hash Browns or hashed browns are potato recipe. 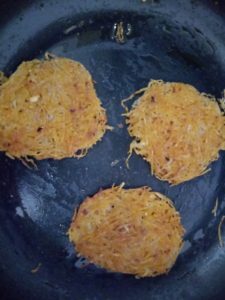 In which potatoes are shredded, rinsed and cooked with butter. 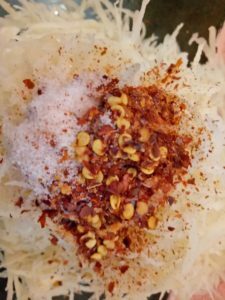 It is a very popular breakfast or snack recipe. 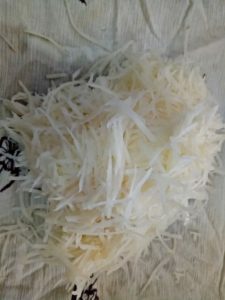 It is a hit potato recipe. 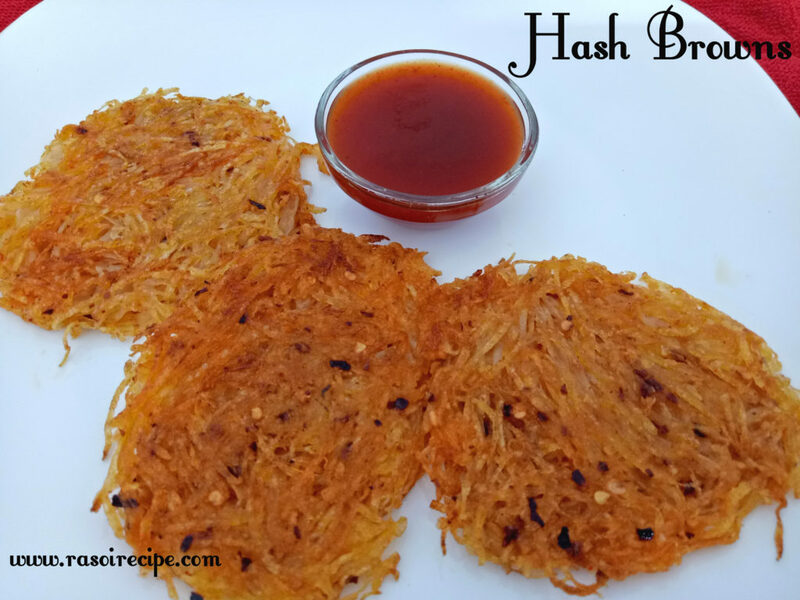 Follow this recipe step by step to get that crispy and perfect hash browns. 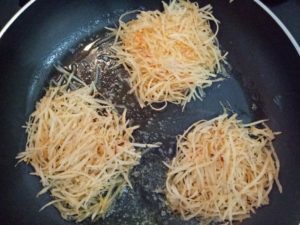 For crispy hash browns, you can select any variety of potato, but the ones with thin skin potato are best ones. 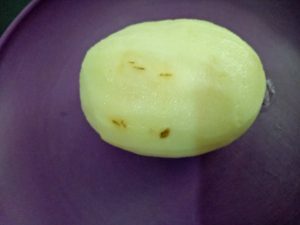 Potatoes which are thin-skinned contains less amount of starch. Starch does not allow browns to get crispy, that is why we keep them in ice-cold water. 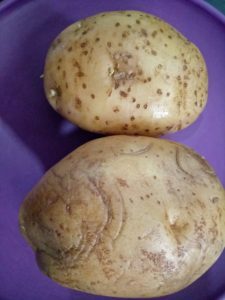 Peel potatoes, grate them carefully. 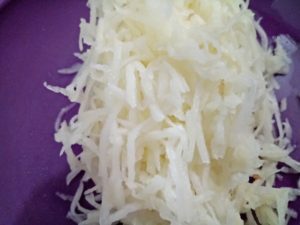 Keep grated potatoes in ice-cold water for at least 10-15 minutes. 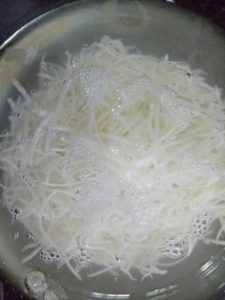 After 15 minutes, strain shredded potatoes nicely first with the help of strainer then with the help of a muslin cloth. 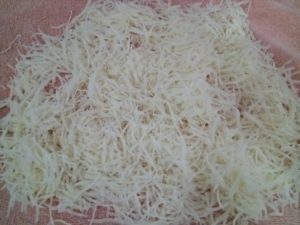 (For this recipe, you need perfectly dried potato threads) After drying with the help of cloth, let it air dry for 5 mins. After 5 mins, in a mixing bowl, mix shredded potato threads, salt, red chilli flakes/crushed black peppercorn. 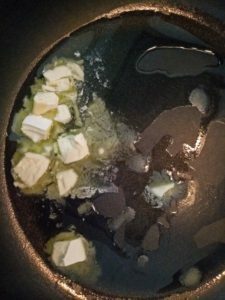 Next, heat oil / butter in a deep pan. 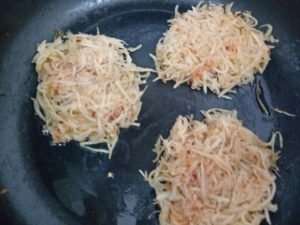 Now start preparing hash browns of your desired size, I prepared mine in two batches, three small hash browns in one batch. 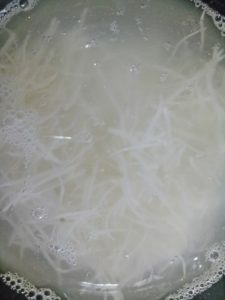 Shallow fry for at least 10-15 minutes on low-medium heat on one side, without stirring or flipping hash brown. Then after 10-15 mins, flip it on other side. Fry again on low-medium heat for 10-15 minutes. So yummy. I love hash browns.